Measuring the success of a company's leader is complex. Achieving sustainable business growth is one benchmark while improving efficiency is another. The bottom line always plays a key role too. 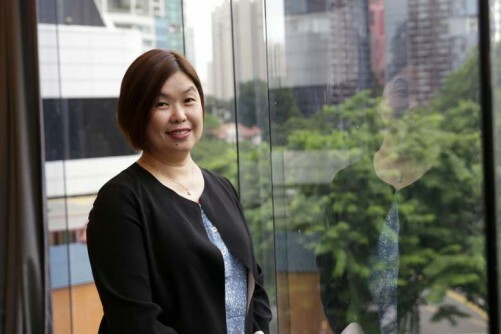 For UPS Singapore managing director Michelle Ho, appointed to the role earlier this year, leadership is also about creating an organisation where her colleagues feel they belong. "One of my top priorities is to make sure employee engagement remains at the heart of our company culture, even as we grow our business in Singapore," she said. "I intend to reach out to all our employees, from our small package drivers to the accounts executives on the ground - people that do the real heavy lifting for the company in a sense, so that UPS can always deliver its best services." A company veteran of 23 years, Ms Ho started out in 1993 as a finance and accounting collection supervisor at the logistics giant. There's nothing that can inhibit your career. Women here have equal opportunities for education, and many companies now also place a lot of emphasis on gender diversity. And I think this is the right move. Having diversity really brings the different perspectives that a company needs in this day and age. MS MICHELLE HO, UPS Singapore managing director, who believes there is no stopping Singaporean women from having a fruitful career. Hard work and dedication rewarded her with plenty of career opportunities - including a promotion to her previous role of finance vice-president for UPS Asia Pacific - but she never forgot that it is the nuts and bolts that make a machine tick. "People are an aspect of my career that has always been very close to my heart. I guess having worked my way up the ranks at the company does allow me to empathise with colleagues at all levels. "And there are many stories that affirm my belief. At a recent event, we honoured a staff member who was retiring after 22 years at UPS. What he said really moved me: Life is always tough, and four out of five days' work will frustrate you. But the toil became bearable when he saw the people around him." It is now her habit to visit UPS' operations centre weekly to speak with the drivers and package workers, whose joy at even a slight gesture of appreciation often makes her day. Meanwhile, as someone in her early 50s, Ms Ho sees technology as an important tool for UPS Singapore to break new ground. A key initiative on this front is already in place. Last month, UPS announced that it will open an on-demand 3D printing facility in Singapore by the end of the year. Launched in partnership with industry specialist Fast Radius, it will extend UPS' 3D manufacturing and delivery service network outside the United States for the first time. The announcement comes at a time when technologies such as robotics and 3D printing are being tipped as drivers for the struggling manufacturing sector to upgrade amid economic restructuring. Ms Ho hopes that UPS can contribute to this process: "I'm eager to see how our 3D printing solutions can help change the landscape of local businesses along the manufacturing supply chain." Another area of technology application is enhancing delivery efficiency. "Singapore is also the first country in Asia where UPS brought in telematics technology from the US. It is integrated with our 'diad' - the handheld devices that you see our drivers use in deliveries - and allows us to analyse data such as a driver's location, whether he's put on his seat belt, or whether the truck engine is on. "The data gives us an idea of how we can optimise our delivery fleet efficiency. But just as importantly, it's also about the safety of our employees - another key part of our company culture." Ms Ho knows she shoulders plenty of expectations as the head of UPS Singapore, which is also the group's Asia-Pacific headquarters. As she takes up the challenge in this latest stage of her career, Ms Ho is grateful that her husband has been supportive throughout the years. "Without him, I don't see how I could, for instance, have taken my MBA when my second child was just three months old," she said. Her two children are now 21 and 18. Ms Ho believes there is no stopping Singaporean women from having a fruitful career. "There's nothing that can inhibit your career. Women here have equal opportunities for education, and many companies now also place a lot of emphasis on gender diversity. And I think this is the right move. Having diversity really brings the different perspectives that a company needs in this day and age."